I have wholegrain bread baking in the breadmaker (with two and a half hours to go)... And I have raspberry and white choc muffins on the rack cooling!!! 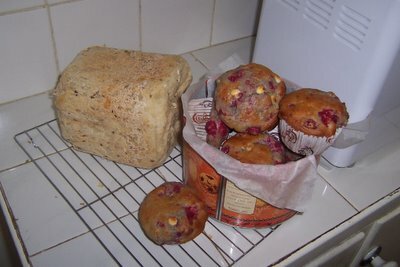 The bread is a premix from a packet but the muffins were from scratch :)... I'm feeling very domesticated today! Wow, I am impressed Sif! You are turning into Martha Stewart, or perhaps Nigella Lawson! Yummy! Yum Yum and YUM! You domestic godess you! I am just going to call you Nigella from now on.